After a thirty year break, the Mad Max series is making a comeback with a brand new movie “Mad Max: Fury Road”. Once again, written and directed by George Millar, the new Mad Max movie looks to be taking us on a roller coaster ride into an apocalyptic future in the company of the “Road Warrior”, this time played by Tom Hardy in place of Mel Gibson. “Mad Max: Fury Road” is due to be released in May 2015 and, by the look of the Mad Max trailer, it’s going to be a movie that old Mad Max fans are going to enjoy. While you wait for “Mad Max: Fury Road” to come to a cinema near you, here are some fun facts about the Mad Max movies to whet your appetite. Mel Gibson got the part of Mad Max by sheer fluke. Originally, Gibson only attended auditions for Mad Max to support his friend Steve Bisley. One of the casting agents spotted Gibson, who was at the time sporting a black eye he got in a fight and asked him to come back later. Steve Bisley got the part of Goose and, as we know, Mel Gibson got the part of Mad Max, the part which shot him to stardom. The biker gang in the first Mad Max movie, led by the character Toecutter, were played by members of real Australian biker MC’s. The cast for the gang were recruited from an Australian club, the Vigilantes and from the Australian Hells Angels. When Mad Max was originally released in the US, it was dubbed by American actors, because the film distributors thought that Americans would have a hard time with the Australian accents. DVD’s of the first Mad Max film now come with the original dialogue but, on some DVD’s there is still a US Dubbed version available. Mad Max was banned in New Zealand when it was first released because of the scene when the character Goose gets burned to death in his car was very similar to a real life incident that had occurred in New Zealand. It was later shown in New Zealand, in 1983, but, with an 18 certificate. The creators of “Saw” took their inspiration for their highly successful harrow flick from a scene in Mad Max. The scene that gave them the idea for their movie was the one where Mad Max handcuffs Johnny the Boy, to a petrol soaked car and throws him a hacksaw. The scene at the end of “Mad Max: Beyond Thunderdome” that sees the characters finding themselves in a sandstorm was shot in a real sandstorm. The storm hit the crew while they were filming and they carried on, taking cover the best they could. Mad Max was shot on a shoestring budget of just £350,000 in twelve weeks. A lot of the extras who appear in the film were paid with a pack of 24 cans of beer for their efforts. Fans of the original trilogy will be pleased to hear that. “Mad Max: Fury Road” is a brand new story and not a rehash of one of the originals. We've all had enough of poor rip-off remakes of old classics! More than 80% of the stunts and action sequences in “Mad Max: Fury Road” are real, not CGI. Another refreshing change for a new movie! Mad Max fans have more to look forward to as there will be more in this new series of Mad Max films. Tom hardy, the new Mad Max, has announced that he has already been signed to do three more Mad Max movies. 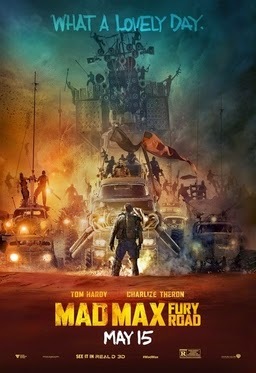 “Mad Max: Fury Road” will have its world premiere at Cannes Film Festival on 14th May 2015 and the movie will be in UK cinemas from 15th May 2015.